This phantom '66 Chevy II Nova sedan delivery wagon was built using a Mike's Miniature Motors resin body and the AMT/Ertl 1966 Chevorlet Nova SS kit. Back at the time I built this model, most guys were building these as tubbed out pro street cars, so I decided to do something a bit different. My concept for the Nova was to build it as if it were a shop truck for a paint and body shop. Like something a custom painter might drive. It's a simple slam model and doesn't have a chassis or interior. The wheels are from the old AMT 69 Chevelle kit but I turned them on a lathe to look like wheels without trim rings. Center caps from AMT's '32 Ford were used to replicate the old police car style poverty caps. Other details include trick side exits made from aluminum tube and a Tom Dillion license plate. For color I decided to do something a little out of the ordinary and painted the Nova in a solid gloss tan color. It's a Testors color and it was shot using a spray bomb and then polished out with a Micro Mesh polishing kit. 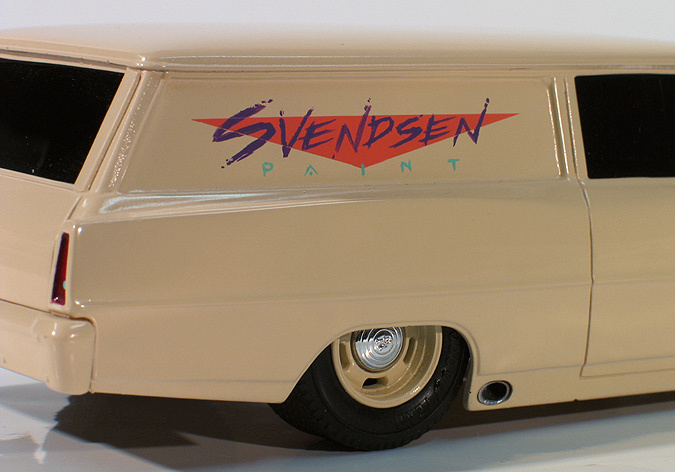 The "Svendsen Paint" logos on the side panels were painted on by hand. My hands were a lot more steady back then. Footnote; Mike of Mike's Miniature Motors died during the '90s and the company went out of business so these bodies are no longer available. It's a real shame. I met Mike once and he was a really nice guy and made some great resin kits. I've got a couple of his kits stashed away and hope to build them someday.